School is starting in this area and that means that I am on the hunt for easy after school snacks just like these Ranch Cheeze-Its. We have started a snack box that I have filled with 100-150 calorie packs. The boys know that they can grab one ready made treat bag and one piece of fruit. 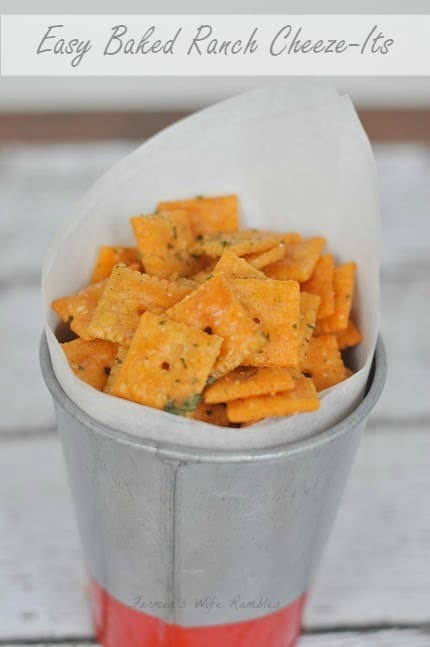 These Ranch Cheeze-Its make for the perfect after school snack because they are clean to eat (we spend a lot of time in the car), bake up a large batch quickly and the boys can have about 20 crackers with their piece of fruit. Preheat oven to 250 degrees. Line a large cookie sheet with parchment paper. Combine vegetable oil and dry Ranch Seasoning Mix in large bowl. Add the box of Cheese-Its to the your Ranch/Oil mixture. 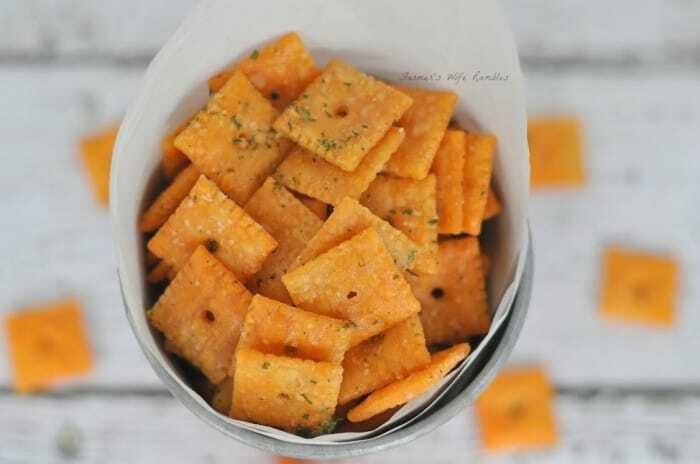 Make sure to mix well so that all Cheeze-Its are covered. Spread crackers out on cookie sheet in a single layer. Bake for 15-20 minutes. When your kids hit the door after a long day what kind of snack do you reach for? What a great idea to put a new twist on a standard snack. Oh they look so yummy. One of my favorite snacks and one of my favorite dressings. You are brilliant! These look so good. Perfect snack! I think my kids would enjoy these as a lunchbox item. Ranch is always a hit at our house. What a great idea!! Bet these are addictive!